José María Florit, the curator of the Monastery of El Escorial at the beginning of the twentieth century, spent his tenure restoring the palace to the original appearance it had at the time of Philip II, its founder. 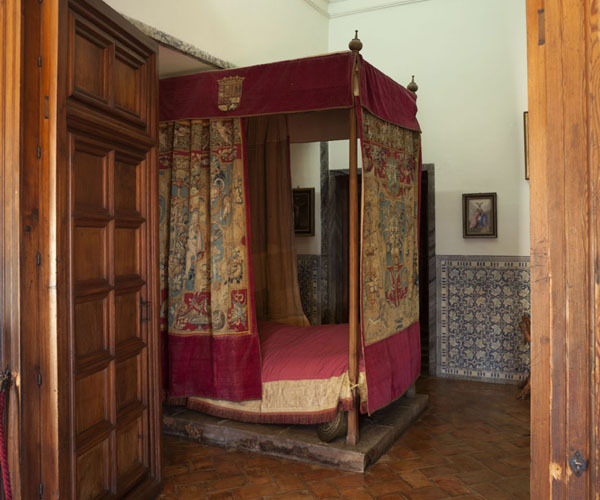 He based his work for the rebuilding of the King’s bed on documentation which indicated that it was decorated with curtains and valances in velvet fabrics during winter. At the outset, he chose a simpler fabric with a border, which can be seen in old photographs. 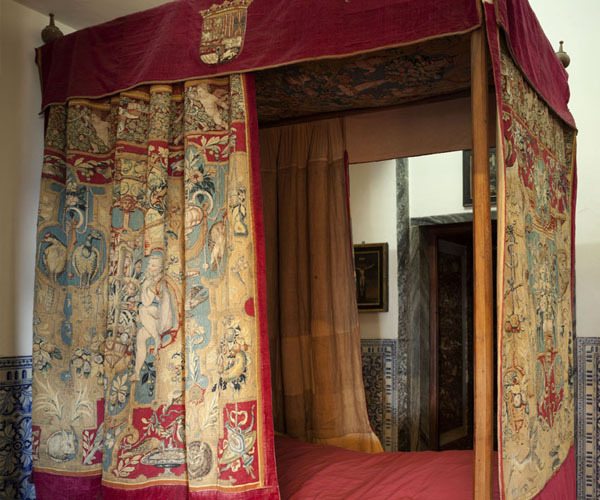 However, later on, in order to enrich the drapery, he incorporated tapestries with grotesques from the royal collection at the back of the room. Unfortunately, part of the border of this series was cut in order to fit with the chimney. The King’s coat of arms is also present on the valances. 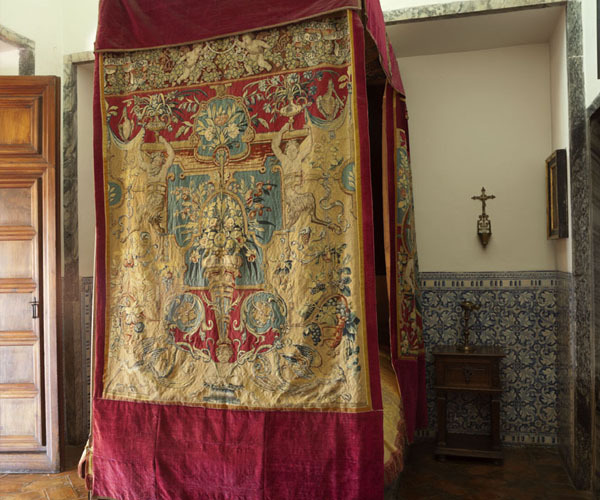 The series is made up of four tapestries – three hanging ones, which are used as curtains, and the canopy of the bed – which all feature profane motifs: fruit, flowers, animals, caryatids and banners. The theme of grotesques was very fashionable at the end of the sixteenth century, and this series is coupled with a series depicting monkeys which is currently displayed in the Royal Palace of El Pardo. These decorative motifs are used in frescoes in the monastery, although with a clear religious and moralizing meaning. The only pagan grotesques, related closely to Antiquity, are in areas of the palace such as the vault of the so-called Hall of Battles. This series is related to the Marriage Chamber. In the first lateral tapestry, two naked figures stand out – a man and a woman – beneath whom there is a child and a lamb. Both symbolize the patience which is necessary for matrimony. In the next lateral tapestry, apart from the masses of birds, the rabbit and lynx stand out: they are poking their heads out of holes in the ground, symbolizing cunning and fear. The upper border, with little angels and garlands, has an inscription in the centre which reads DOMINVS ILLVMINATIO MEA in a phylactery. In the centre of the tapestry at the foot of the bed we see a large vase, flanked by a male and female faun. The upper border is similar to the previous tapestry with two inscriptions. The first reads SPERAVIT. LIBERABO EVM/ QUEM COGNOVIT. NOME MEVM., and the second SPAVIT. LIBE/RABO/EV/COENOVIT/ EV. QM. NOME./ PEGA MEV. The roof is made up of four triangular parts which together form a whole. In the centre of one of the larger triangles we see the figure of Daphne turned into a tree, inside a ferronnerie (artists’ forge); on each side of this there is a depiction of the god Hermes holding snakes in his hands. The decoration is rounded off with isolated vases of flowers and fruits dispersed around the background. In the central part of the opposite triangle we see a large vase of flowers, beneath a canopy; in its three corners a naked man and woman, sitting on banners, hold ropes from which birds hang. In one of the smaller triangles we see a dressed female, a symbol of Virtue, flanked by another two – one male and one female – who are sitting facing one another. In the lower part, two centaurs are depicted, symbolising carnal desire. In the triangle opposite this, we see a vase of flowers in the centre with a naked child perched on top; in the lower corners, we see a young man and old man, symbols of the ages of life.